“Smasher” Will Delight Techie Fans of Sci-Fi. Smasher by Scott Bly. Blue Sky Press, an imprint of Scholastic Inc., New York, 2014. Ages 8-14; grades 5-8. Twelve-year-old Charles chafes under his grandfather’s rules. He doesn’t want to study. In fact, he’s planning on running away. But when he is visited by robotic, time traveling, Geneva, a girl from 2042 who insists he travel to the future to save it, he’s not sure he wants to run that far away. At first glance I wasn’t at all sure I was going to enjoy this book. The first few pages, describing a boy in the 1500’s speaking like a kid in the 2000’s, was off-putting for this historical fiction fan. In the authors note, Bly explains that he wanted the language to be accessible to today’s kids, so he had Charles (who soon goes by Charlie) speak like a contemporary twelve-year-old. It was probably the right decision for his target audience. Geneva needs Charlie to help save the future because Charlie has a special gift. In Charlie’s time, many people are aware of the “Hum,” a magical power. Only a few people, however, know how to use it. Charlie’s family does. At first Charlie doesn’t trust Geneva, because his grandfather has told him not to trust anyone: he could end up dead because people with such power have been persecuted. But Charlie has another gift that Geneva needs. He is a math genius. 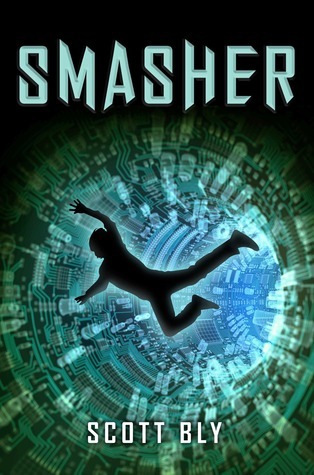 Smasher is a fast moving page turner that even a non-techie like me enjoyed. Just to be clear, there is a lot of math and techie speech in this book that a phobic like me didn’t even try to understand. The action, though, and the premise, hooked me. Two kids with special gifts out to save the world will pique my interest every time. It took me awhile to get used to the omniscient voice. Because of that, I felt I didn’t really know Charlie, the main character, until much later in the story. Geneva was a more fully developed character from her first appearance. But those are minor points. This book will be devoured by readers who are into science fiction with a dab of fantasy.